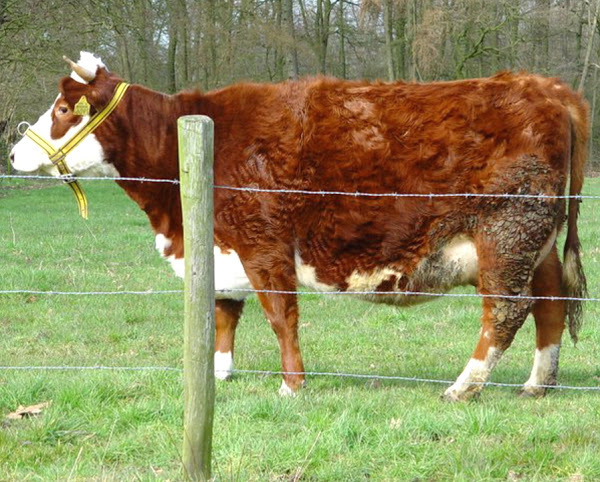 Blaarkop cattle are medium-sized typically with black color with a white head and belly. Although about 5 percent of the total population are red in color rather than black. The breed is sturdily built with matching muscles, a horned head and have very strong legs. There are black ring (blister) around their eyes, and the tail has a white tip. Both bulls and cows usually have small horns. Their average height vary from 135 to 140 cm, and about 145 to 150 cm for the bulls. The mature bulls on average weight around 800 kg. And the average live body weight of the mature cows is around 600 kg.